Each year, as more dentists begin to see how the microscope can change the way you view your profession, a shift in focus occurs. For most of the clinicians integrating their first microscope into their practice, the introduction of this new technology occurs as almost an afterthought. 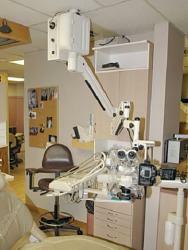 In most cases the microscope is mounted to the ceiling, wall or foor of the existing operatory and expected to fit in with the rest of the equipment in the room and with the existing schedule of the clinician. Unfortunately, the tremendous improvement in visual acuity that becomes apparent to the new microscope user, is all to often juxtaposed against the ergonomic diffculties that occur due to the haphazard manner in which the microscope is introduced. Many practitioners are left to the whims of the microscope representative, who searches for the most stable structural location to mount the scope, which often is not the ideal spot ergonomically. 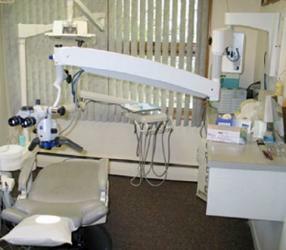 In addition, existing equipment in the operatory including delivery systems, dental chairs, patient chairs and monitors may be less than ideal to promote synergy with the microscope. In fact in many instances the position, style and design of these existing pieces of clinician’s armamentarium may actually hinder the successful integration of the microscope for daily routine usage. At present, there is an interest amongst long term microscope users to now focus on this piece of the operatory armamentarium as the centerpiece and starting point of the operatory, around which the rest of the room is organized. 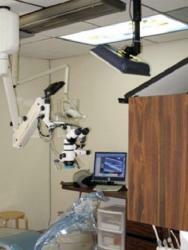 There are many successful locations where structurally a microscope can be mounted. These include ceiling mounts (patients left hip), wall mounts (Side wall or rear wall of the operatory) or in the foor of the operatory again at the patients left hip. Ceiling tracks systems allow for movement of the microscope between operatories. These systems can be costly, and are more commonly found to carry the microscope longitudinally between the foot of the chair and the head of it, in operatories of increased length. Ideally, the microscope seems to work best when it is within easy reach of the clinician (wall mount on clinicians side) if the entry to the operatory is at the foot of the chair. When a dual rear entry to an operatory is employed the ideal location seems to be a ceiling mount at the patients left hip. For clinicians looking at integrating multiple operatories, at least one microscope company allows for the practice to equip each operatory with a support arm and illumination module at a roughly a quarter to a third of the overall cost of a new microscope. The optics can then be carried between operatories, until the clinician is prepared financially and emotionally to place optics in more rooms. Outside of hygiene operatories, where the microscope may not be used in all practices by the hygienist, a dental operatory light is not needed as the scope illumination is suffcient for all procedures even if the scope optically is not being used (injections, rubber dam placement etc.) (Fig. 1, 2). 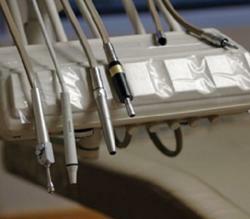 Traditional dental operatories have relied upon many systems for the delivery of handpieces. The success of rear delivery systems where the handpieces are located to the rear of the patient and available to the clinician’s left hand are not ideal for microscope operatories. The clinician, to effectively use the microscope, must remain at the binoculars of the scope and rely upon excellence in 4 handed assistant enhanced delivery for suction, air, water and instrument exchange. This auxillary is the liason between the microscopic and macroscopic world, and must	be utilized for handing of all equipment including handpieces, and firm exchanges of instruments not reliant on visual confrmation of passage. For this reason the handpieces should be within reach of the assistant (Continental or Transthoracic delivery system or near the assistant such as the upcoming Over the Head system from Design Ergonomics.) Side delivery systems are satisfactory if they are within reach of the clinician but again bur changes must be done by the dentist instead of the assistant with this setup (Fig. 3, 4). In microscope centered practices the need for comfortable seating for the clinician is important but the additional requirement for support of the gross	motor joints (shoulder and elbow) is needed to allow the fine motor joints of the wrist and fingers to perform the fine motor movements (microns vs millimeters) that are needed at higher levels of magnification. Microsurgeon stools with full adjustability of both the height, seat and arm rests, allow for full support of the forearm enhancing the ability of the clinician to work at higher powers of magnifcation. With the use of these chairs the dentist is able to work in a «comfortably slumped» posture with arms supported in the midline at heart level height, and pain free for the back and neck (Fig. 5). Most dental patient chairs focus on comfort for the patient lying in one position for lengthy periods of time. 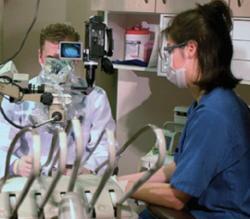 Microscope centered practices require that the clinician move less than other dentists and therefore the patient, their head or mirror movements are required. 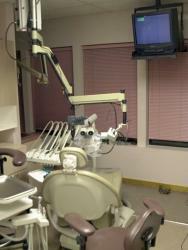 The needs for a dental chair in a microscope centered practice require that the chair can swivel left or right to allow for easy changes in operator position behind the patient (9 am to 1 pm for the right handed dentist, and 11 am to 3 pm for the left handed operator). The dental chair should been narrow backed to allow for movement the clinician around the chair and knobs on the articulated headrest should be not present to allow for the clinician to lift the headrest up slightly with their non dominant leg to alter focus for photography or high magnifcation work without touching the scope. The	chair must go low to the foor for direct viewing of the mandibular arch (Semi supine patient, inclined scope with binoculars tipped towards the clinician). Finally the chair should allow for comfort of all patients to have their heads positioned at the end of the chair and to allow for comfort for lengthy appointments through the usage of memory foam, heaters or massage units. Many microscope centered practices find themselves doing more work on less patients daily and the patient move more frequently for visual field purposes and to eliminate discomfort accumulating in these lengthy appointments. Microscope centered practices quickly realize the four advantages of the microscope to be improvements in treatment outcomes, ergonomics for the dentist, communication and documentation. The latter two advantages rely upon the inclusion of a beamsplitter, video camera and or digital camera to the microscope. The inclusion of these accessories creates a world of opportunity to educate staff, patients and colleagues. The author believes that proper placement of these monitors can really help with all procedures from new patient exams and 2nd opinion, to alterations in treatment plans mid-procedure to regular routine dentistry. A minimum of two monitors to a maximum of four is needed depending on the needs of the clinician. 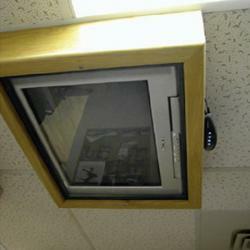 A patient monitor mounted in the ceiling of the operatory should be a minimum of 19 inches to allow allow for the patient to see around the scope. It can be hooked up to a TV, LCD or plasma monitor, and can show live video or TV. The placement can be in many locations but the author has found that placement slightly behind the patient and slightly to the opposite side of the dentist (left side for a right handed operator) can be used effectively and viewed by patients when the operator is positioned behind the patient (Fig. 6 a,b). A general practice often employs an assistant monitor. 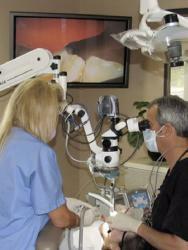 Endodontists, particularly those trained at P.E.R.F. by Dr. Gary Carr, prefer an extra side of oculars (assistants side scope) to allow for the assistant to be able to view first hand the procedure. These monitors allow for assistants to avoid refection from mirrors of the coaxial illumination. They also allow assistants to get a view of the operating feld, enabling them to anticipate the next step, and to serve as a «2nd set» of eyes. The view may not be as clear of the scope, but in restorative procedures and new patient exams where frequent movement of the scope occurs compared to the more stable position of the microscope during endodontics. The third monitor is one that is used for patient sensitive information and this can be accessed by the dental assistant for entering of procedural information, accessing information about the patient in the dental chart and for setting up appointments. It is convenient if located at the rear of the operatory behind the patient. The final monitor is located at the foot of the chair and is useful for clinicians using their operatory for over the shoulder teaching programs, or in situations where the clinician is recording either digital still microphotography or videography and wishes to see if the information is properly focussed, framed and exposed. Some microscope clinicians find that this monitor can be a large LCD or plasma monitor located at the foot of the chair and again connected to the documentation sources attached to the microscope (Fig. 7 a,b). In closing, the overall size of a microscope centered operatory does not need to be different in shape, size or function from a typical operatory seen elsewhere. The position of the microscope itself and the location of the auxillary items necessary for the successful integration of the scope to the practice such as dentist stool, patient chair, monitors and delivery system can be renovated or constructed in such a fashion as to work synergistically as opposed to hindering microscope integration. If you focus on the details in the operatory, the big picture will become a lot clearer!